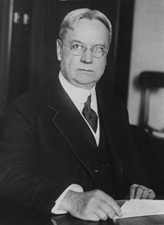 JOHNSON, Hiram Warren, (son of Grove Lawrence Johnson), a Senator from California; born in Sacramento, Calif., September 2, 1866; attended the public schools and the University of California at Berkeley; studied law; admitted to the bar in 1888 and commenced practice in Sacramento; moved to San Francisco in 1902; active in reform politics and assistant district attorney of San Francisco; one of the founders of the Progressive Party in 1912 and nominee for Vice President of the United States on the Progressive ticket in 1912 with Theodore Roosevelt; Governor of California 1911-1917, when he resigned, having previously been elected Senator; elected as a Republican to the United States Senate in 1916 for the term beginning March 4, 1917, but, preferring to continue as Governor, did not assume his senatorial duties until March 16, 1917; reelected in 1922, 1928, 1934 and again in 1940 and served from March 16, 1917, until his death in the naval hospital at Bethesda, Md., August 6, 1945; chairman, Committee on Cuban Relations (Sixty-sixth Congress), Committee on Patents (Sixty-seventh Congress), Committee on Immigration (Sixty-eighth through Seventy-first Congresses), Committee on Territories and Insular Possessions (Sixty-eighth Congress), and Committee on Commerce (Seventy-first and Seventy-second Congresses); interment in Cyprus Lawn Cemetery, San Francisco, Calif.
American National Biography; Dictionary of American Biography; Johnson, Hiram. The Diary Letters of Hiram Johnson, 1917-1945. Edited by Robert E. Burke. 7 vols. New York: Garland Publishing, 1983; Weatherson, Michael A. Hiram Johnson: Political Revivalist. Lanham, MD: University Press of America, 1995.